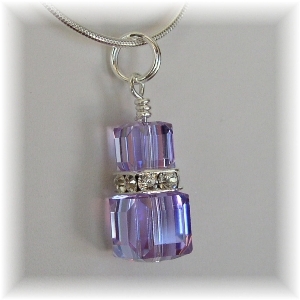 Beautiful Alexandrite crystal pendant with your choice of 16" - 24" sterling silver chain. Swarovski 6mm and 8mm Alexandrite cubes separated by a beautiful crystal squaredelle on a 16" sterling chain. (18", 20" and 24" chains available for an additional fee).. These beautiful Swarovski crystal beads are color changing, depending on the light source! The beads change from a light blue to a violet under incandescent light and sunlight. Our best selling "everyday" necklace. Purchase the matching cube earrings for a perfect set! * Sterling chain styles will vary based on availability.